Wow, already up to the first Slumberland strip. I typically drew or assembled the Sunday features at the very last minute (in contrast to the daily strips, which I usually drew 3-5 weeks in advance), but I took some time on this one. I finished it up at around the time I went home to Ohio for the holidays. I remember my mother didn’t believe at first that I’d drawn it, which flattered me ridiculously. It’s not great, but it’s certainly much better than most of what I was drawing at the time. The strip is, of course, a pastiche of Winsor McCay’s Little Nemo in Slumberland and Little Nemo in the Land of Wonderful Dreams. After it ran, I didn’t get any emails from Winsor McCay fans, but I did hear from people who thought I was copying either a) the 1990 NES game “Little Nemo: The Dream Master,” or b) an issue of Neil Gaiman’s Sandman that also includes a “Little Nemo” pastiche. 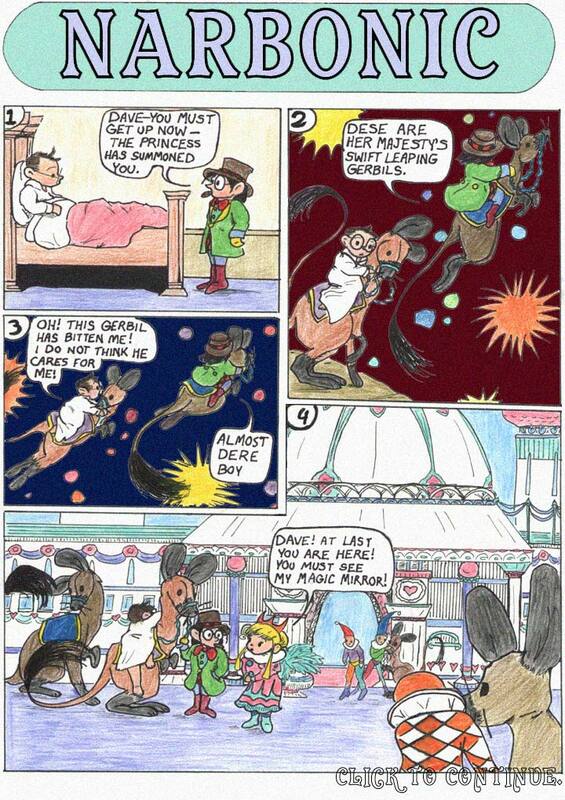 After a couple of years, either Narbonic started attracting more comic-literate readers or Winsor McCay started to get more public attention, because I received email from lots of people who were into Little Nemo. My personal favorite “Little Nemo” tribute is the Tom Petty video for Running Down a Dream. Most of the images in this strip are based directly on material from the McCay strips. The opening panels are taken from the first “Little Nemo.” The palace is a crude facsimile of architecture from some of McCay’s political cartoons for the Hearst syndicate, which he did later in his career. You can tell he wasn’t particularly interested in whatever political point he’d been assigned to make, because he’d expend enormous energy on incredibly detailed, breathtaking backgrounds, full of beautiful landscapes and neo-classical buildings. I don’t remember where I got the idea to do a Little Nemo-inspired strip, but it became a New Year’s tradition. As many people have noticed over the years, these strips cryptically foreshadowed events in the coming year of Narbonic, something I was able to do because I plotted so absurdly far in advance. This strip alludes to events in the next several storylines. Also, Caliban makes an advance cameo appearance. I should have made him look more like a Winsor McCay devil, with long spindly horns. McCay drew fantastic devils. He drew fantastic everything. As I’m sure all the Winsor McCay fans out there already know, the “rarebit” line at the end is a reference to McCay’s other dream strip, Dreams of a Rarebit Fiend. The idea behind the title was that eating Welsh rarebit would give you bad dreams, although the strips typically end with the characters frantically swearing off all kinds of different foods. If you will forgive me afterward, let me tell you my story about this episode. The first time I read this episode was in 2005, when I was introduced to Narbonic. And it made perfect sense to me. Riding on the critical success of the Victorian episodes, it stands to reason that the next step is to assume the form of that bridge across the centuries, Little Nemo. 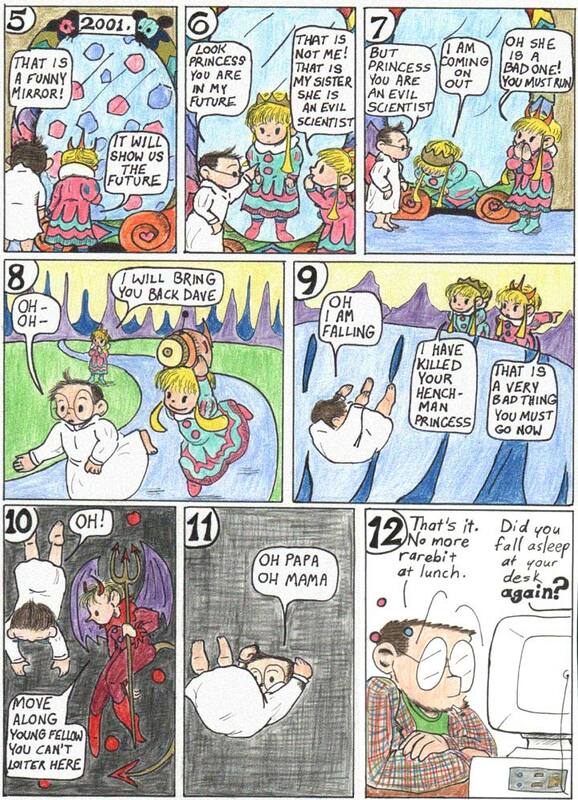 (I was fortunate enough to, at that time, have seen at least two genuine Little Nemo episodes prior to that day. I dare say that the only other pre-1950 comic that I was aware of at that time was Ginger Meggs.) I scarcely cared for the portrayed events themselves, because I was under the assumption that they might be elaborate caricatures of famous Nemo storylines of which I was unaware. And so on I went. The second time I read it was in January 16 of this year.And only then, after all of the events of Narbonic had been wound into the past, after reading The Phone Call and knowing the events of the coming year, did I realise what was actually going on all along. Like a Magic Eye picture springing forth from coloured haze, the magical, wonderful foreshadowing astounded me. To think that the events of Narbonic were always here, were always going to happen. Everything had been determined and designed! For the second time this year, this online comic had left me genuinely floored. Truly, it was Narbonic’s parting joke from beyond the grave. This episode, incidentally, is very important, for it officially introduces the obscured concept that one of the symptoms of genius is knowledge of the future. Dave manifests this knowledge in today’s episode, and Artie wonders if Helen has always had such knowledge in the second-to-last named story arc. The final half of the final episode is when it is finally brought into light, wonderfully tying together all of the years of Narbonic. P.S: I don’t get it. Panels 2 and 3 have a uniform coloured background (paper cutouts adhered upon coloured cardboard? ), whereas panels 10 and 11 have somewhat sickly-looking coloured cross-hatching. What gives? P.P.S: Caliban has somewhat blonde hair? Well, I never. Normally, the “Oh, no, this character has learned that he is doomed in the future” plot device doesn’t worry the audience half as much as it worries the characters. Narbonic may be the only case I know of in which the readers expressed more concern about a Preordained Doomed Future than the protagonist. There were a lot of things that could have gone wrong with the Little Dave strips, but none of them did. I am completely in love with the writing of these strips. The slight wackiness of “I am coming on out,” the understatement of “That is a very bad thing,” the strangely cute desperation in “Oh Papa Oh Mama,” and the general lack of punctuation all make me very, very, very happy. The “Dave in Slumberland” strips really are pretty darned cool. Rachel: that’s a direct take on McCay’s style, a trope stolen directly from the original Little Nemo comics. I really love this strip. I love the colours, I love the dialogue, I love Dave’s enormous glasses… it’s probably my favourite Narbonic strip up to this point. I’m ashamed to say that until today I had never heard of Little Nemo. I wish I had.